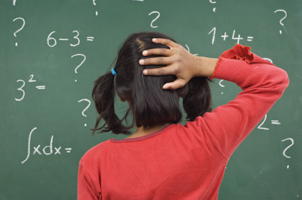 Word problems are an important part of math practice at nearly every grade level. In sixth grade, completing word problems can help students apply the new math concepts they're learning, like proportions and statistics, to real-life situations. It also can help prepare them for standardized tests. Help your child become familiar with word problems by creating your own at home. Be sure to feature math concepts that your child is learning in school. In sixth grade, this includes proportional relationships, negative numbers, division with fractions and statistical thinking. Also, use real-world situations that your child can apply these concepts to, like discounts, tips and debt. To get the most benefit, work with your child to create a schedule so that he or she can get frequent and consistent practice. The exchange rate for U.S. dollars to euros is $1 to 0.71 euros. How many euros is $150 U.S. dollars worth? The ratio for dollars to euros can be written like this: 1/0.71. The proportional relationship for this problem is 1/0.71 = 150/x. Solve for x by cross-multiplying so that x = (0.71)(150) = $106.50. Andy has 3/4 of a cup of frosting left and five cupcakes. How much frosting can he use on each cupcake? Divide the amount of frosting by the number of cupcakes left. The problem should look like this: 3/4 ÷ 5/1. To solve division problems with fractions, turn the second fraction into a reciprocal fraction and multiply. Make a reciprocal fraction by flipping it upside down so that 5/1 becomes 1/5. For this problem, the equation should now look like this: 3/4 x 1/5. Multiply the numerators and denominators so the answer is 3/20. Allison owes her brother $100. If she pays him $40, how much money does she still owe him? Use negative numbers to solve this problem. Allison is in debt, which can be represented by -100. Add the money she paid back (-100 + 40 = -60). So, she still owes $60. If your child is having trouble working with negative numbers, provide him or her with a number line. Nina is able to hit a home run for two out of every 13 balls thrown. What is the likelihood that she will hit a home run in any given at-bat? There's a two out of 13 (2/13) chance that Nina will hit a home run. Find the percent by dividing two by 13 (2 ÷ 13), so there is about a 15% chance that Nina will hit another home run.